Long-awaited revision to a unique guide that covers both compilers and interpreters Revised, updated, and now focusing on Java instead of C++, this long-awaited, latest edition of this popular book teaches programmers and software engineering students how to write compilers and interpreters using Java. 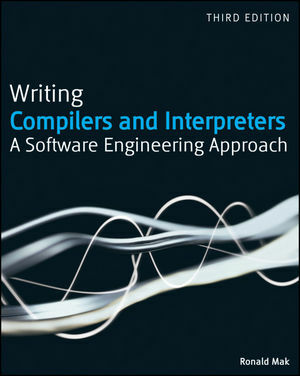 You?ll write compilers and interpreters as case studies, generating general assembly code for a Java Virtual Machine that takes advantage of the Java Collections Framework to shorten and simplify the code. In addition, coverage includes Java Collections Framework, UML modeling, object-oriented programming with design patterns, working with XML intermediate code, and more. Ronald Mak wrote the earlier editions of this very successful book as well as The Martian Principles for Successful Enterprise Systems: 20 Lessons Learned from NASA's Mars Exploration Rover Mission (also published by Wiley). He is also the author of Java Number Cruncher: The Java Programmer's Guide to Numerical Computing. He develops advanced software systems for organizations from startups to NASA. Currently a research staff member at the IBM Almaden Research Center, he also teaches compiler writing and software engineering at San José State University.